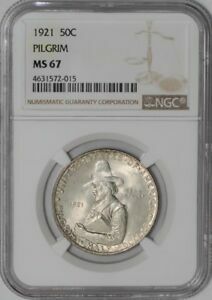 Commemorative coins were still something of a novelty in 1920 when Congress authorized the coining of half dollars to celebrate the three-hundredth anniversary of the arrival of the Pilgrims. Only eight commemorative coin programs had gone before. Some of these included multiple denominations, while a few even offered two different dates of the same design. These multi-date offerings usually resulted from bad timing on the part of the authorizing commissions. 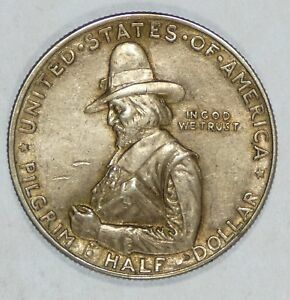 The Pilgrim Tercentenary half dollar of 1920-21, however, was the first issue coined with more than one date for the sole purpose of achieving repeat sales. It set an alarming precedent for future programs, since this gimmick would be repeated numerous times, much to the irritation of collectors. This kind of scheming contrasts sharply with the Pilgrims themselves, who rejected material wealth, along with ostentatious display and gregarious behavior. It was their rejection of the Church of England, however, that earned them the title Separatists, as well as the wrath of Britain's King James I. Forced to flee to Holland, their price of freedom proved to be limited opportunities and a growing loss of their English culture in exchange for mere tolerance by the Dutch. Holland, certainly, was not the refuge they sought. With backing from a group of English investors hoping to reap profits in the New World, the Pilgrims sailed westward in the late summer of 1620, landing on November 11 at a place they named Provincetown Bay, on what would ultimately be called Cape Cod. With winter approaching, they quickly settled on a site for their colony, christening it Plymouth after their departure point from England. Nearly starving that first year, only their instruction by natives in the planting of corn enabled the colonists to carry on. The next several summers brought new arrivals, and the Plymouth Colony thrived. Not everyone was a Separatist, however, and those who couldn't stand the severity of that lifestyle soon formed neighboring communities. The Pilgrim Separatists ultimately became a minority of the population, and the Plymouth Colony was absorbed into the greater Colony of Massachusetts in 1691. The summer of 1920 witnessed many celebrations throughout New England marking the 300th anniversary of the Pilgrims' arrival. Among the souvenir items planned was a commemorative half dollar, the proceeds from which would be used to fund some of these events. The bill as originally read called for the minting of half a million pieces! 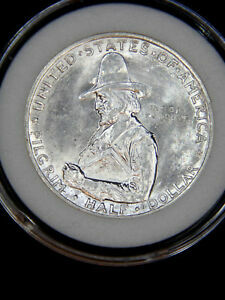 Assured that this was a misprint, Congress instead approved a still-generous mintage of 300,000. The legislation was not passed until May 12, however: all those concerned would have to act quickly to get the coins into production. Boston sculptor Cyrus E. Dallin was selected by the Tercentenary Commission to prepare models showing a portrait of Plymouth Colony Governor William Bradford and the Pilgrim's ship, the Mayflower, on which they made their historic journey in 1620. 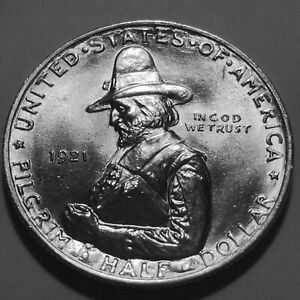 Dallin ran afoul of the Commission of Fine Arts' sculptor member, James Earle Fraser of Buffalo nickel fame, who found fault with his execution of the inscriptions: "Altogether the design for the Pilgrim fifty cent coin is good. The part that seems to me to need most attention if there is time is the lettering." Of course, there wasn't time to correct this, and the Fine Arts Commission's decision to not render a verdict on Dallin's models prompted the Treasury Department to simply disregard their comments and proceed with the preparation of dies. 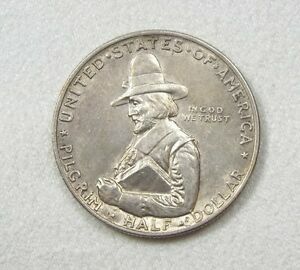 In October of 1920 a total of 200,112 Pilgrim halves were struck at the Philadelphia Mint, the odd 112 pieces being reserved for assay and later destroyed. The coins were first offered for sale at $1 apiece in November. Distribution was handled by the Shawmut National Bank of Boston and the coins were available at every bank in Boston and Plymouth. Although there was no official packaging, two types of boxes were privately produced. 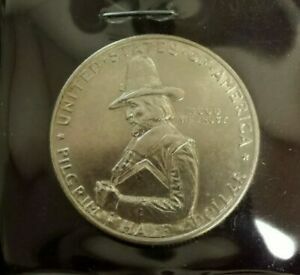 One was gold with a green coin sleeve inside, and was imprinted with PEOPLE'S SAVINGS BANK, WORCHESTER, MASS. The other, a white box with a circular coin slot, was imprinted with SOCIETY OF COLONIAL WARS, IN THE STATE OF RHODE ISLAND AND PROVIDENCE PLANTATIONS. Both of these are quite valuable today. 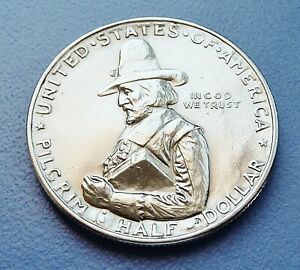 The obverse of the Pilgrim Tercentenary half dollar portrays a left-facing, half-length figure of William Bradford, the second governor of the Plymouth Colony. He assumed this role in 1621 and was re-elected thirty times! The image is fanciful, as no actual portrait of him exists. He holds in his left arm what is most likely the Bible, but what has also been identified as his own book History of Plimmoth Plantation. 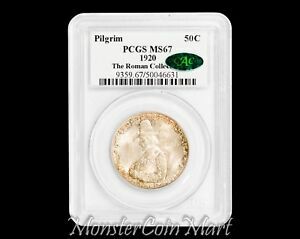 Behind his portrait is the motto IN GOD WE TRUST, while the legends UNITED STATES OF AMERICA and PILGRIM HALF DOLLAR are arranged peripherally, separated by stars. Dallin's incuse initial D appears below Bradford's elbow. The reverse is dominated by a three-quarters view of the Mayflower sailing on rough seas. Its rigging is erroneous, the forward jib sail being of a type not utilized as early as 1620. The inscription PILGRIM TERCENTENARY CELEBRATION is arranged peripherally. Separated from it by stars are the dual dates 1620 - 1920. Coming out so late in the year, much of the enthusiasm which might have greeted these coins during the summer months had already dissipated. Many thousands remained unsold as the town of Plymouth, Massachusetts prepared for additional commemorative activities during 1921. With sales resuming, but at a much slower pace, something was needed to prompt additional buyers or, better still, repeat buyers. As only 200,000 coins had been struck from the authorized figure of 300,000, the Tercentenary Commission requested that the remaining balance be minted with the date 1921. That date was added in small figures to the obverse field, and the additional 100,000 halves were minted in July of that year. Although there were some collectors who responded with repeat orders, the severe economic recession of 1921-22 worked against these coins becoming a financial bonanza for the Commission. 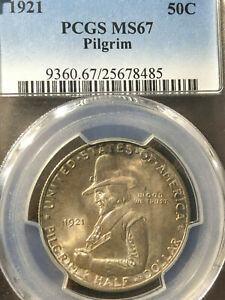 Conceding that this issue had run its course, they returned to the mint for melting some 48,000 halves dated 1920 and 80,000 of the 1921 striking. This left net mintages of 152,000 for 1920 and just 20,000 for 1921. 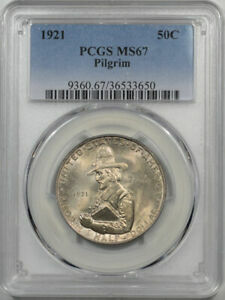 As the 1920 coin was sold primarily to the general public, it is often encountered with ugly toning or harshly cleaned. It is readily available in grades up through MS-65 but quite scarce above that level. 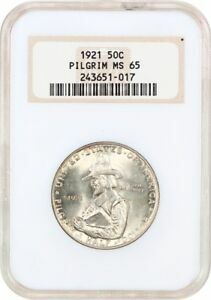 Much of the 1921 issue went directly to dealers and speculators, so in spite of its lower mintage, a larger proportion of high-grade survivors exists. In grades of MS-64 and higher, a few hundred have been certified. 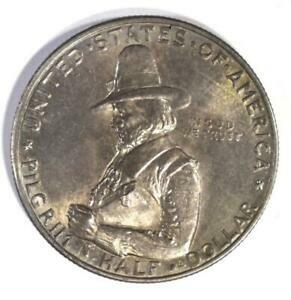 Wear on Pilgrim halves appears first on Bradford's cheekbone and the hair above his ear; on the reverse, check the crow's nest and stern of the Mayflower. 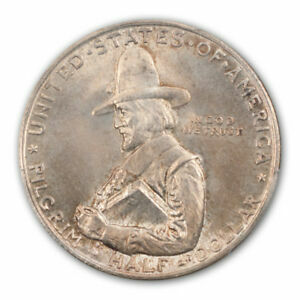 A few of the 1921 Pilgrim halves will show die-clash marks but this feature is more commonly seen on the 1920 issue, often accompanied by die striations. Two matte proofs are known of the 1920 coinage, one of these from the estate of Mint engraver John R. Sinnock, while a single 1921 in matte proof is also rumored to exist. 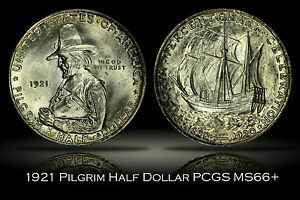 1920 U.S. PILGRIM COMMEMORATIVE SILVER HALF DOLLAR ALMOST UNCIRCULATED COND. 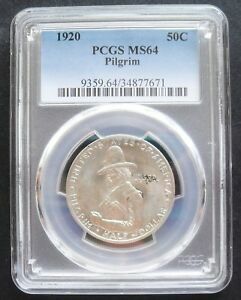 1920 PILGRIM HALF DOLLAR PCGS MS 64 SILVER COMMEMORATIVE COIN .